Let�s say that James had siblings who were born between 1825-1835 in OH. James� father would have been in the 1830 census in Ohio, and James or his father would have been in the 1840 census in OH and perhaps also in the 1850 census of OH or in Franklin Co. IN where James B. French�s wife lived. The 1880 census of Salt Creek, Franklin Co., IN, states that James B. French�s father was born in NY and his mother in VT. James was 49 when he stated those facts, but it has been virtually impossible to find this family further back. James died 7 years later, and for all we know, he could have been thinking about his grandfather, not his father. Also, he could have been thinking that he emigrated through NY, having come from England, but not really born in NY. 1.2 John French, b. 30 Oct 1832 in Hamilton, OH, had the following passport issued on 25 Oct 1862 at age 29, stating he was born in Hamilton, OH. �A� John French was born in New York and appears in the 1830 census of German, Clark Co., OH. In 1840 he is in the same township. In the 1850 census, he is in the same township, born in 1795 in New York, age 55, living with his wife Ann, age 48, born in VA. They have son David French, b. 1823 in OH, son Michael French born 1834 in OH, son Charles b. 1835 in OH, son James b. 1838 in OH, and son Truman b. 1844 in OH. He could have been James French�s uncle. James French�s father was born in New York according to the 1880 census of son James French of Salt Creek, Franklin Co., IN, when James was 52 and states that his mother was born in Vermont and his father in New York – this is the best clue we have so far for his ancestry. Using a birth date for his father not after 1814 (using setting 1794-1814) when he would have been 18 to 38 years of age, if he had son James in 1831, and was born in NY, and lived in OH where we know his son James was born, I would first search the 1850 census, two years before James was married and perhaps he lived at home. There are 7 men as such: John, Samson, Truman, David, William, James, and Marvin. John, b. 1795 in NY, but wife Ann was not born in VT, but they do have a son James b. 1838 in OH. Samson, b. 1796 in NY, but wife Betsy was not born in VT.
Truman, b. 1804 in NY, but wife Rosetta was not born in VT.
David, b. 1807 in NY, but wife Sarah was not born in VT.
William, b. 1809 in NY, but wife Margaret was not born in VT.
James, b. 1811 in NY, but wife Rebecca was not born in VT, and their children are too young. Proven incorrect. Marvin, b. 1813 in NY, but wife Anna was not born in VT.
No luck there. So I sent back and looked at the original copy of the 1880 census. It clearly states that his mother was born in Vermont, and on the same page with the same handwriting is written Virginia, and they are very much different. Looking at the 1850 census for a female (now French) born 1804-1817 in Vermont, I find 6 responses of women who lived in 1850 in Ohio: Nancy, Philena, Sophia, Asenath, Nancy, and Mary. One of these women could have been the mother of James and that her husband had died. Nancy, b. 1804 in VT, living with husband Ira French who was also born in VT. They had son Maynard French Sr. who was b. 7 Aug 1838 in Evansville, Vanderburg Co., IN, and d. 9 Nov 1882 in Glendale, Hamilton Co., OH. He m. Adaline C. Harwood French (1840-1903) and had 3 children: William Taylor French, Edward Harwood French, Wallace French. For details, see http://www.findagrave.com/cgi-bin/fg.cgi?page=gr&GRid=42123160. Philena, b. 1806 in VT, living with husband Artemas French who was also born in VT, b. 1798 and lived in Painesville, Lake Co. OH in 1850 and 1860 and 1870. Sophia, b. 1807 in VT, living with husband Jedidiah French who was also born in VT.
James French, b. 1833 in OH, In the 1880 census of Whitewater, Grand Traverse Co., MI, James is listed as married to Amanda; he is 47 and she is 37. Because he is listed in the 1880 census in MI, he could not be also listed in the 1880 census of Salt Creek, IN, so this James is probably not the correct one, but he almost fits. Nancy, b. 1811 in VT, living with husband Edwin who was born in OH in 1808. Mary, b. 1817 in VT, living with husband Isaac who was also born in VT.
� James G. French of Reily, Butler Co., OH. He seems like the most logical person (see the 1840 census of Franklin Co., IN). There are 9 men named James French who lived in New York in 1830 in these counties: Tompkins, Orange, Chenango, Steuben, New York, Steuben, Tioga, Yates, and Monroe. The puzzle would be easy if we knew his name were James. 1840 Census Ohio when James was 8 years old. I would highly suspect that both James and his father were in Ohio or perhaps Franklin County, Indiana. 1840 Census Franklin County, Indiana. There is an I.G. French listed in the combined territories of Washington and Marion and Sandcreek and Clay and Adams in Decatur, Indiana. Because of the mention of Sandcreek, this could be a possibility. In parentheses they list I. G. French as J. G. French on ancestry.com, which is a welcoming clue in that he could have been James. Listed are 1 male under 5, no males listed between 5 and 10 which would include James at age 9, 3 males between 10 thru 14 (one might be James depending on when the census was taken), 1 male from 15 thru 19, 2 males from 40 to 49, 1 female under 5, 2 females from 15 to 19, 1 female from 30 thru 39, a total of 11 people. His father would have been born between 1790 to 1800. His neighbors were Parker and Johnson, which doesn�t provide any clue. So, let�s take a look at that person born in New York. � James N. French in Jackson, Champaign Co., OH (incorrect middle initial). � James Burgess French, age 61, b. ca. 1789, in the 1850 census of Muskingum Co., OH, married to Nancy Triplett, but they are both from Virginia and part of FFA Chart #36 that have different DNA test results. Looking at the 1830 census of Wayne Co., OH, for any French, and there are 5: Alpheas, Ora, James, Moses, and Richard. Alpheas, he was over 50 and children were over 10. He was b. 1771 in MA. Ora B, he was b. 1806 in NY, and his wife Abbey was born in NY. No son James in later census records. Then looking at the 1840 census of Ohio for any French with a son aged 8, and there are 14 with children under 20. Isaac, child under 20 is a daughter. *This cuts it down to 8. Hoping these men are still alive in 1850 and still living in Ohio, comments are given above in parenthesis, but no luck. Now, let�s just look at all the census records for any woman with the surname French who was born before 1816 in Vermont and married between 1814-1834. None were born in VT. Then, do the same search with no name to search, but that her husband was a French born in NY. Too many. Of all these searches, the closest parents would be Cyrus E. French, b. 1801 in NH, and both his parents were born in NH, and his wife Sarah J. French, b. 1812 in VT. They have a son James H. French, b. 1838 in Sharon, Medina Co., OH. Nothing more can be found as far as I can see. Looking at Wayne Co., OH, only son Charles b. 1857 is listed. In one of my searches, I came across a James French born ca. 1801 in NY, aged 79 in the 1880 census of Elmira, Chemung Co., NY, living with his wife Martha, born 1812 in NJ, and who parents were both born in NJ. James father was born in Vermont and his mother in NH. This James never lived in Ohio, plus his middle initial was S, not B. So, searching all census records for a James B. French born between 1827 and 1837, I find 24. None fit. From a book I read online, Abraham French was a resident of Franklin Township in Ohio in the �Hanging Rock Iron Region� (which is near Salt Creek) in 1816, but that his father, Henry French, did not vote in that area. Henry French was born in Virginia in 1765, and his wife, Abigail, in 1773. They moved to Gallia County in 1815, and soon thereafter to Franklin Co., OH. Abraham became an active citizen of Jackson, Ohio, and married Rachel Ridenour in Dec 1832, and they moved into the town where they opened a tavern, which they conducted until 1865. He also managed a stage line from Gallipolis through Jackson to Chillicothe, and had several mail routes. His sons, Smith French and A. A. French drove coaches and lived on Salt Creek. This information is from FFA Chart #192 which has completely different DNA – DNA Group 11. Let�s suppose that James French was born in NY in 1832 and moved to Ohio by the 1850 census. George French, b. 1818 in NY, lived in Dayton, Montgomery Co., OH, in the 1880 census. These would have been the correct dates and places of the father of James B. French, but no link has been determined. Lewis French, b. 1837 in OH, resided in Wayne, Montgomery Co., OH, where he registered for the draft during the Civil War, 1863-1865. He was married and age 26 by 11 Jul 1863. This Civil War Draft Registration shows brothers James and Lewis listed together, both born in Ohio, and living in Wayne, Montgomery, Ohio in 1863. Unfortunately, this Lewis is from FFA Chart #36. Another listing in the 1880 census of Wayne, Montgomery Co., OH, states that James French was 46, born 1834 in OH, married to Martha, who was 31 at that time, born in 1849 in OH. Living next to James is another French family: Louis, b. 1838; Mary A. (wife of Louis) b. 1839; and their children George C. b, 1863, Sarah J., b. 1865, Harriet, b. 1867; Luella, b. 1871, Mary E., b. 1873, Davis C., b. 1878. Because these names conflict with the actual family of this line (FFA Chart #202), I�m considering any of the French family from Wayne, Montgomery Co., OH, not to be of this line. Charles B. French, b. 1859 in OH. He d. 7 Jan 1948 in Wayne Co., OH, and is buried at the Wayne County Home Cemetery in Wooster, Wayne Co., OH. Sluman M. French was a restaurant and confectionery owner in Osceola, Polk Co., Nebraska. He moved to Nebraska in April 1880 and opened his business that year in Oct. He was born in Geauga Co., OH on 20 Nov 1828, left his native state in 1847, and came West to Illinois, where he was engaged in farming for a number of years. Cassius Clarence French of FFA Chart #202 was b. 7 Apr 1887 in Osceola, Polk Co., Nebraska. Because of the proximity of dates, and that Sluman was born in 1828 and James in 1832, these lines may be connected. Sherman Morgan (called Morgan) French also lived in Osceola, Polk Co., Nebraska in 1880. He was b. 1828 in OH, and his parents were both born in NY. In 1850 and 1860 he was living in Paw Paw, DeKalb Co., IL. Probably his father, Sherman French lived in New York and married there on 3 Aug 1828 in Monroe, NY, to Laury Turney; however, they stayed in NY, and since James was born 1831 in Ohio, Sherman is not his father. John W. French was b. 1839 in Warren Co., OH, and was admitted to the U.S. National Homes for Disabled Volunteer Soldiers in 1873 in Dayton, Montgomery Co. (formerly Greene Co.), Ohio. Right area and right time to be a brother of James. He states that his parents were Samuel F. French and Rachel French, and there is no James in the family in 1850 when James would have been 19 and could have moved away. Samuel was b. in 1818 in Ohio and was living in 1880 in Farmington, Trumbull Co., OH. He states both his parents were born in NY. He is a farmer and married to Mary French, probably a second married because she was 36, born in Ireland in 1844, and he was 62, born in 1818 in Ohio. We believe that our line never lived in Iowa. Clarence m. Stella A. Pool before 1925. An Iowa State Census Collection, 1836-1925, with a census taken on 1 Jan 1925, states that Clarence was b. ca. 1885 (different from 1887) in Nebraska, he was married to Stella A. Pool of Nevada, Story Co., Iowa, b. 1882 in Iowa, the dau. of Hannah Bryant of Iowa and Butler Pool of Indiana. Clarence�s father was Ira French, born in Indiana, and his mother was Sabina Webbe, born in Iowa. The 1930 census shows Clarence, b. 1887 in Nebraska, living in 1930 in Nevada, Story Co., Iowa with his spouse Stella and 2 children: Greta and Max. The Social Security Death Index states that Clarence was born 18 Nov 1885 and d. Jan 1969 at age 83 in Nevada, Story Co., IA. Greta Fern French, b. 1913 in Iowa, lived in the 1930 census in Nevada, Story Co., Iowa. By 1925 when she was 12, she was living with N.C. and Addie Smith, but the record states that her father was Clarence French of Nebraska and her mother was Grace Perry. Greta was the niece of N. C. Smith. In the 1920 census of Richland, Story Co., Iowa, she is living with her parents, Clarence and Grace E. French, and with her brother Everett, b. 1818 in Iowa, also to the same parents. I would assume that by 1925, either Greta died because in the 1930 census, Greta is living with Stella, her step-mother, and with Everett whom they refer to as Max. Everett Max French, b. 12 Mar 1918 in Iowa, lived in the 1930 census in Nevada, Story Co., Iowa. He d. Oct 1974. He enlisted in WWII on 17 Mar 1943, in Iowa, a Private, single without dependents. In the 1830 census, Ora B. French (20-30) was living in Lake, Wayne Co., OH with only his wife Abigail (20-30), no children. They were both born between 1800-1810. Ora B. French was born in New York on 18 Nov 1805 and therefore was 25 years old when he first appears in Ohio. By the 1840 census, Ora was living in Porter Co., IN, when James would have been 9 years old. Listed with him is a son between 0-5 who would be Solon. Also listed is a son age 5-9 who would be Alpheus. There are no older children; therefore, James is not part of this family, but he could have been a son of a brother of Ora. Both Ora and his wife were 30-39. They also have 1 daughter 0-5 and 3 more daughters 5-9. He was the Postmaster, along with E. J. Green, of Porter township, Indiana. James French, b. 1 Jul 1831 in OH (date conflicts with next birth) – not of this line, but close. By the 1850 census of Porter, Porter Co., IN, Ora states he was born in NY in 1806, his wife Abigail was b. in 1810 in NY, and living with 6 children. By the 1860 census in Porter, Ora is 54, Abbey is 50, living with 9 children. Ora B. French signed a land certificate on 1 Jul 1831 in Wayne Co., OH; he owned 80 acres which he purchased on 24 Apr 1820 along the Ohio River in Wayne Co., OH. Ora B. French had relatives Alpheus and Calvin and Elder French who appears in the History of Pine twp., Porter Co., IN, in 1838 . Alpheus was b. 1771 (perhaps the father of Ora), d. 1860, and is buried at the Old City Cemetery in Valparaiso, Porter Co., IN. Ora B. French died 3 May 1891 at 85y 5m 5d. There, he was born on 18 Nov 1805 using this calculator: http://www.timeanddate.com/date/duration.html. He is buried at the Ludington Cemetery in Porter Co., IN. According to the census records, Abby was 5 years younger than Ora. 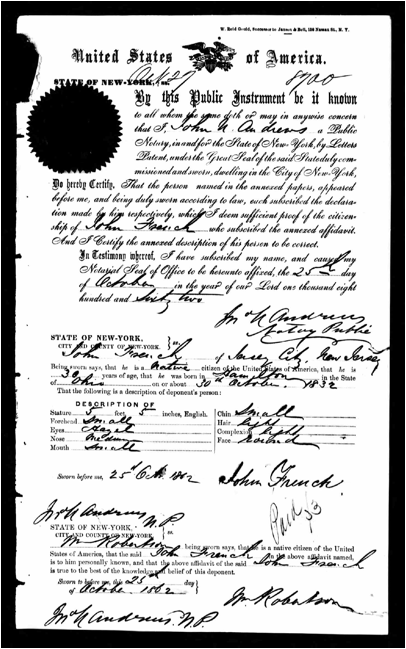 By the 1880 census, Ora was a farmer, widower, born in New York, living with daughters Wealthy, Sylvia, and Susan. 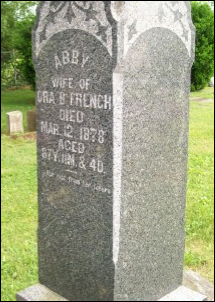 Abby, wife of Ora B. French d. 12 Mar 1878, aged 87y 11m 4d. She was born in 1810, therefore, the gravestone is incorrect. She was 45 years old when she had her last child. John French, b. ca. 1838 in OH, who lived in Dixon, Preble Co., OH, in 1880 could possibly have been a brother of James; however, he states that both his parents were born in PA.
Catherine J. French, b. ca. 1828 in OH, who lived in Gratis, Preble Co., OH, in the 1850 census, was married to Joseph French. His criteria does not fit in this family. I checked the marriage records from 1820 to 1832 in OH, and there are no French men. Sherman French lived in New York and married there on 3 Aug 1828 in Monroe, NY, to Laury Turney; however, they stayed in NY. There are only 7 men born in NY between 1795-1815 when James� father would have been only 16 when he had him, or 36 at the oldest. James French�s mother could have been Rachel M. French, b. 1795 in Vermont, a widow in the 1850 census of Washington, Morrow Co., Ohio, living with her daughter Minerva French, born 1818 in Vermont, who married Wellington Cass, b. 1817 in New York. They had daughter Thankful J. Cass, b. 1848 in Ohio, who married Joseph Burt. Thankful�s father was born in New York and her mother in Vermont. The strange situation is that James does not appear in the 1850 census nor in the 1870 census. The ONLY James listed in the 1870 census are James French of Dorr, Allegan Co., Michigan and James French of Hudson, Summit Co., OH, each born ca. 1831-1833. The James of Hudson does not fit in any way or shape. The James from Dorr does have possibilities. His parents were John and Asenath French; John was born in NH, but his first child was born in NY, perhaps indicating that he also was born in NY; Asenath was born in VT. However, this James appears in the 1860 census in Dorr and is therefore conflicting with the James in the 1860 census in Salt Creek, Decatur Co., IN, which is the one we are looking for. James French, b. 1833 in OH, In the 1880 census of Whitewater, Grand Traverse Co., MI, James is listed as married to Amanda; he is 47 and she is 37. From the History of Waynesboro: Waynesboro County was formerly called Cumberland, but later called Franklin County. First settlers here were Adam French in 1829 where his house is listed as the last one in town. Also listed are J. B. French and A. A. French as being members of the Waynesboro Lodge, I.O.O.F. In 1899 Mrs. Ethel French, guardian of finance, is listed. James B. French is again listed as first corporal during the War for the Union in 1861. Also listed is Colonel V. H. French. James B. French is listed again as a charter member of Captain Walker Post numbered 27. Waynesboro and Cumberland and Franklin Counties were formerly in the Commonwealth of Pennsylvania. Note that the James B. French of Pennsylvania was born in 1842 in PA.
John A. French was b. 1798 and d. 22 Oct 1850, aged 52 years old, and is buried at the Sand Creek (not Salt Creek) Cemetery, Greensburg, Decatur Co., IN. 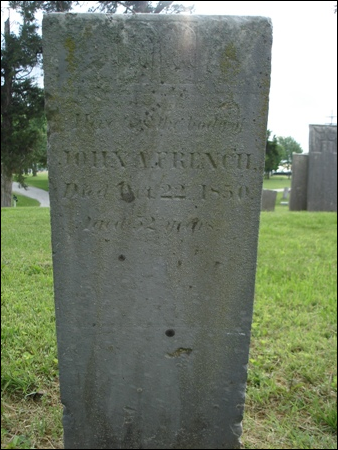 John A. French is the only French buried at the Sand Creek Cemetery. Ancestry.com shows 14 men named John A. French, none from Indiana or Ohio. There is �a� John L. French, b. 1798 in NY, living in 1850 in Jennings Co. next to Decatur Co., IN, m. Polly Ross on 21 Mar 1824. Another John French was b. 1795 in NY and lived in German, Clark Co., OH, in 1850. The French Lick Township is found in Greensburg and named after the French country, not the surname. It got its name from an early French outpost in the area and the nearby salt lick – the town has rich mineral springs. 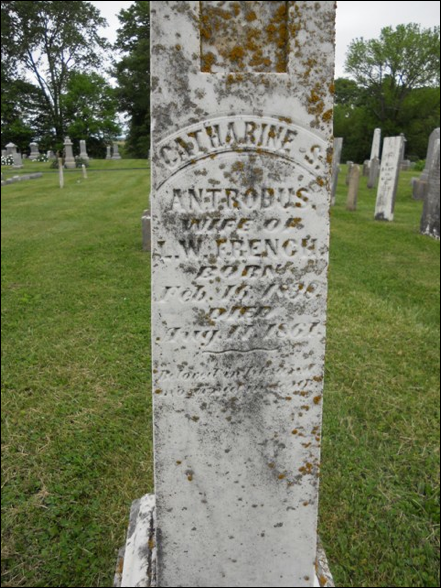 Also buried in Decatur Co., IN is Catharine S. Antrobus, married to L. W. French (Loraine W. French, also referred to as Loring) on 2 Jan 1860 in Washington, Decatur Co., IN. She was born 16 Feb 1838 in Greensburg, Indiana, d. 11 Aug 1861 at age only 23, and was buried at the Kingston Cemetery in Kingston, Decatur Co., IN. Catherine S. Antrobus is listed in the 1850 census of Washington, Decatur Co., IN, living with her parents who were from Kentucky and her siblings. Dr. Loring W. French, one of the pioneer dentists of the Pacific Coast, was born in the town of Rising Sun (later called Randolph Twp. ), Ohio County, Indiana, January 31, 1836. From 1852 to 1856 he was engaged with his brother, William M. French**, in publishing the Jeffersonville (Indiana) Republican*. During the latter year he began the study of dentistry in Louisville, Kentucky, with Dr. J. A. McClellen, cousin of General George B. McClellen. 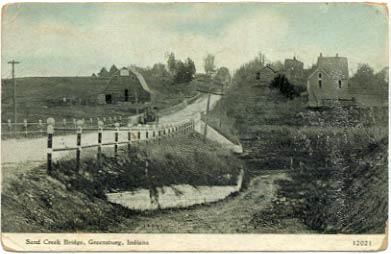 Locating in Greensburg, Indiana, he practiced six years, and upon the breaking out of the civil war he enlisted as a private in the Seventy-sixth Indiana Volunteer Infantry, for the term of six months. His regiment did post duty in Henderson, Kentucky, where he served a good portion of his term as Quartermaster. Soon after leaving the service he came to California, via the Nicaragua route, arriving in San Francisco in March 1863. Going from there to Sierra County, and later to Plumas County, he settled in practice in La Porte, formerly one of the most important mining towns in the State, remaining there six years. He invested a large portion of the earnings from his professional work in mines and prospecting — with loss. In 1868 he came to Los Angeles, then a place of between 4,000 and 5,000 population, when the land in close proximity to the town could be bought for 50 cents per acre. At that time the only dentists in Southern California were one or two who traveled about, stopping a few days in a place, and who left soon after Dr. French settled here. He soon controlled the entire dental business of this part of the State, his patients often coming a hundred miles, and even from Arizona, to have work done. Dr. French is one of the original members of the Odontological Society of Southern California, and has been its treasurer from its organization. He is a member of the A. O. U. W., was a charter member of Golden Rule Lodge, No. 160, Los Angeles, and three times its presiding officer, He was Treasurer of the Southern California Odontological Society. Loring�s son Charles is also mentioned. Website: http://www.archive.org/stream/illustratedhisto01lewi/illustratedhisto01lewi_djvu.txt. *The Indiana Republican of Rising Sun, Indiana shows publication dates of 1851-1854, and the publishers were W. M. & L. W. French. It was a weekly publication in English, independent on all subjects – neutral on none. In late April 1854 French moved the paper to Jeffersonville in Clark County. In his April 22, 1854 editorial, French said the title would be changed to "The Jeffersonville Republican." No issues with this title have been located, but it is known that on May 6, 1859, the title was French's Republican. Publishers: Aug. 1851-Sept. 1851, Hayden & Gregory; Sept. 1851-Dec. 1852, French & Gregory; Dec. 1852-Jan. 1853, William M. French; Jan. 1853-Sept. 1853, French & Craft; Sept. 1853-Nov. 1853, W. M. French; Nov. 1853-Apr. 1854, W. M. & L. W. French. William M. French lived in Clark Co., IN, in 1858. The 1850 census of Gill, Sullivan Co., IN shows a William French b. 1825 in IN and a Wallace French b. 1830 in IN, and a Hester French born 1832 in IN. They are ages 25, 20, and 18 – no parents listed. Catherine S. Antrobus French, d. 11 Aug 1861 at age only 23, and was buried at the Kingston Cemetery in Kingston, Decatur Co., IN. **William M. French was b. 1831 in Ohio and states in the 1910 census of Porter, Porter Co., IN, that he is 79 and both parents were born in NY, the same as his brother had stated. Another William M. French (see below) was b. 1816 in New York (this could be the father of the one above, but only 15 years apart) and d. 8 Apr 1889. He m. E. Caroline who was b. 30 Aug 1818 and d. 23 Sep 1887. They lived in Madison, Jefferson Co., IN, in the 1850 census with their son Hayden T. French, b. 1840 in IN and lived in Jeffersonville, Clark Co., IN, in the 1860 census at age 19. Along with H. T. French in the 1860 census mentioned above are W. W. French, b. 1818 in New York (Wealthy French) and E. L. French, a female, b. 1819 in Indiana which shows that the family moved from NY to Indiana between 1818 and 1819. Living with them in this 1860 census is the Johnson family who are from Vermont. James B. French stated that his mother was from Vermont and his father from New York and that they both moved to Ohio where he was born. His mother might have been Hannah Johnson, age 54, born ca. 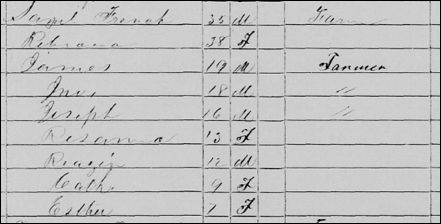 1806 in VT, who is in this census. It appears that Hannah Johnson is widowed and living with her 3 children (J. Johnson, A.M. Johnson, and Simeon S. Johnson), but perhaps she was first married to a man named French who could have died and she had children by him who are older than the Johnson children. They were also living with the Harbin family in 1860 who were from Kentucky. Perhaps one of the wives was a French. These could be the family of James B. French – more research is needed. 0.1 Hannah Johnson, b. 1806 in VT, lived in Jeffersonville, Clark Co., IN in 1860. She was married to James Johnson ca. 1824, and they are found in the 1850 census, living in West Windsor, Windsor Co., VT, with their son Simeon S. Johnson, b. 1836 in VT.
1.2 J. (Jonathan) Johnson (male) b. 1824 in VT, m. A. (Ann) M. Johnson (female), b. 1828 in PA. He lived in Jeffersonville, Clark Co., IN on 1 Jul 1863 when he signed up for the U.S. Civil War Draft. 1.3 Simeon S. Johnson, b. 1836 in VT, lived in Jeffersonville, Clark Co., IN, in 1860. 1.1 William M. French, b. 1816 in NY, d. 8 Apr 1889 where?, m. E. Caroline who was b. 30 Aug 1818 and d. 23 Sep 1887. They lived in Jeffersonville, Clark Co., IN in 1860. He would have been 15 when James was born. 2.1 James B. French, b. 1831 in OH????? 2.4 Hayden T. French, b. 1840 in IN, lived in Jeffersonville, Clark Co., IN, in 1860, parents born in NY. Hayden lived in Madison, Jefferson Co., IN, in 1850 with his parents, William M. French and Caroline E. French. 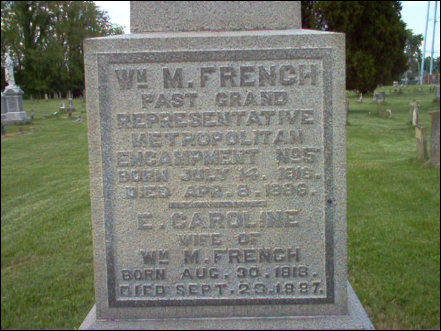 William M. and E. Caroline French buried at the Union Cemetery, Rising Sun (now called Randolph), Ohio Co., IN. �A� James French b. 1831 in OH, living in Richmond, Huron Co., Ohio on 1 Jul 1863, married, when he registered for the U.S. Civil War Draft of the 9th Congressional District; however, this James turns up in the 1860 census of Richmond, Huron Co., OH living with his wife Eliza which is incorrect, plus their children James and Sarah. In the Ohio Tax Records, 1800-1850, John W. (could be Willard) French is listed in 1835, 1836, and 1837 in Conneaut Twp., Ashtabula Co., OH. Apparently many of these early settlers to Conneaut came from Harpersfield, NY, in 1798 when Alexander Harper moved his company �Old Harpersfield Land Company� when he heard that western areas were �flowing with milk and honey�. No French is listed among the early settlers. There was a Volney F. French from this area who is part of FFA Chart #5 who was b. 1850 in PA. Also listed is an identified D. W. French who came to Ohio in 1820 and attended the district schools of Leroy Township, Ashtabula Co., OH. His wife�s name was Martha L. and they are both noted in 1833 at the Oberlin College. Also listed are Frank French, H. J. French, and W. M. French. D. W. French owned land in Rome, Ashtabula Co., OH in 1905. Also listed is N. E. French who was elected and held his office from 1858 to 1861. But, because James was a farmer, the FFA highly suspects that his father was also a farmer and that this is not his family. A good bet is James French b. 1831 in Ohio, living in the 1850 census of Lykens (North Shenango), Crawford Co., OH with his parents, Samuel, age 35 and Rebecca (Woodrow??) age 38. He is the oldest of 7 children. Others are Jno French, age 18; Joseph French age 16; Rosanna French age 13; Reazin French age 12; Cath French age 9; Esther French, age 7. Samuel was b. 1815 in OH, and Rebecca was b. 1812 in Ohio. John French, b. 1795 in NY, b. 1794. The burial records of his son say he was b. 2 Feb 1794 in Dummerston, Windham Co., VT and died after 1860 in Adams Twp, Champaign Co., ON. Ann Stephenson French, wife, b. 1802 in Bath Co., Virginia, died before the 1870 census in Adams Twp, Champaign Co., OH – this is probably why James is not in the 1870 census of Salt Lick, Franklin Co., IN – because he was at his brother Charles house when his mother died; his father was living with Charles in Green, Shelby Co., OH, at the time. Charles French, son, b. 1835 in Ohio, b. 1834, b. 1838, d. in Shelby Co., OH on 20 Mar 1915, buried at the County Home Cemetery. James French, son, b. 1838 in Ohio, married in 1852 and moved to Franklin Co. IN. This is probably not the James we are looking for because he died on 8 Feb 1909 and is buried at the County Home Cemetery in Shelby Co., OH.